Thank you John. Thank you very much for giving me this special honor. I am particularly grateful because the honor is given to me on such a wonderful occasion, in the presence of so many good friends, including my daily interlocutors in the White House and the State Department. I am so happy to receive this special honor at this time of the year when most kids are expecting gifts from Santa Claus. (Laughter). 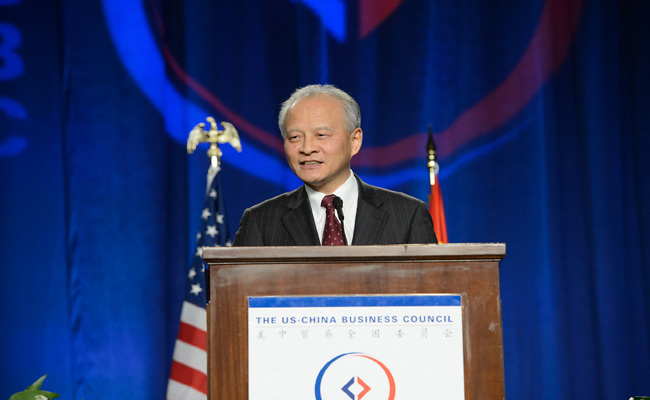 But I want to use this opportunity to express my own gratitude to the USCBC and all its members, for your long-standing commitment, support and contribution to the China-U.S. Relations. Looking back, we have achieved a great deal by working together. And by working together, we have traveled very far. We still remember the days of President Nixon's visit to China, when we had little trade between us. Yet last year, we had over 550 billion dollars of bilateral trade. We still remember the days when the USCBC and others had to organize door-knocking missions on the Capitol Hill for China's MFN status. Now China is a member of the WTO for 15 years already. And we still remember the days when we were working with each other only in the bilateral sphere. Now we are working together to improve global economic governance in G20, particularly thanks to the efforts by Secretary Paulson. We have really traveled very far and achieved a lot. But none of these would have been possible without your efforts and your contribution, for which we are truly grateful. Of course, this relationship is never free of problems. Actually, this relationship is getting stronger and stronger because we are able to solve problems, overcome difficulties, and expand and deepen our cooperation. Going forward, I don't expect smooth sailing either. There will be problems and difficulties from time to time. 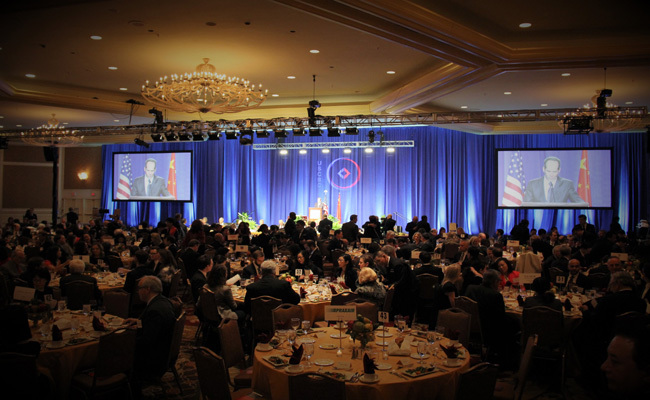 In this regard, we are fully aware of the concerns of the US businesses in recent years. We take them seriously, and we are ready to work with you to address these concerns, so that further progress could be made and mutually-beneficial results could be achieved. At the same time, I think the big picture is still clear - the direction of China's policy, where China is going as a country, how China will deal with its relations with the U.S., especially the business relationship. As President Xi Jinping said again just last month at the APEC CEO Summit in Lima, Peru: China will not shut its door to the outside world, but open itself even wider. We will ensure that there is a level playing field for all companies in China, both domestic and foreign. These steps will make China's investment climate more open, favorable and transparent, thus allowing foreign companies to share in China's growth opportunities. Besides, China is now focused on what we call the "four comprehensives", that is, China's all-round efforts in building a moderately prosperous society, in deepening its reform, in governing the country in accordance with the law, and in enforcing strict Party discipline. This will, first of all, help China further upgrade its economy and society and make new progress in its modernization drive. At the same time, all these will help us create a much better, cleaner, fairer business environment for all companies, particularly American companies operating in China. So I think the big picture is still quite promising. Besides, we do have a number of useful and effective mechanisms to deal with any possible problems, like the S&ED, JCCT, and the latest dialogue mechanism on cyber issues. I hope these mechanisms will continue, and they should be improved and enhanced. Bilaterally, we have such a huge potential for further cooperation. We should do more to help each other in our respective economic restructuring. We should do more to have better macro-economic policy coordination. And we can certainly do more to help each other in improving infrastructure and ensure greater market access to each other, and do a better job in energy, security and environmental protection. In the global context, we are both faced with new and pressing challenges. For instance, technological progress and market forces are transforming the whole global economic structure, international division of labor, patterns of production and consumption, etc. Our two economies are the biggest in the world. We have the responsibility to make sure that everybody would benefit from such transformation, because people are concerned about social injustice, and unfair distribution of wealth. We have to make sure, by working together, that the rising tide does lift all boats. This is our shared responsibility, internationally. Also, there is a rising tendency of protectionism in many places around the world. Some people may believe that their interest will be best served by closing the doors and by fragmenting the global market. We have to show them that everybody will benefit from more openness, a more globalized market and more effective international system. As the two biggest economies in the world and two major trading countries, we certainly stand to win if the global market remains open and inclusive, but not fragmented. There are so many things we can and should do together, for the benefit not only of our two countries, but also of the rest of the world. Of course, none of these would be possible without a stable political relationship between our two great countries. 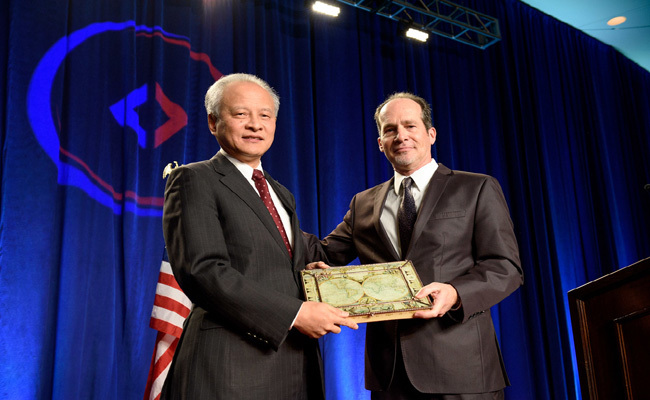 The political foundation of China-U.S. relations should not be undermined. It should be preserved. The basic norms of international relations should be observed, not ignored, certainly not to be seen as something that you can trade off. National sovereignty and territorial integrity are not bargaining chips, absolutely not. I hope everybody will understand that. Then we will be able to develop and expand fruitful cooperation and achieve mutually beneficial results on the basis of mutual understanding and mutual respect. Going forward, whatever happens in the future, we still count on the commitment and support form the business community. I hope that you will continue to play the role as the stabilizer and propeller of this important relationship; you will continue to tell the people of our two countries the true story of China-U.S. relations over the last four decades; and you will continue to help us build mutual confidence and mutual understanding, and work together for mutual benefit. By building an even stronger business relationship, we will be able to open up even better prospects for the overall China-U.S. relations. Let me use this opportunity to wish all of you, and ourselves, great success in the new year.